In less than 2 weeks Stanbic Bank has announced that they will be further reducing their Visa card payments to $100 until the end of the month. This is effective immediately and the bank also announces that come 1 November one will have to make prior arrangements with the bank. 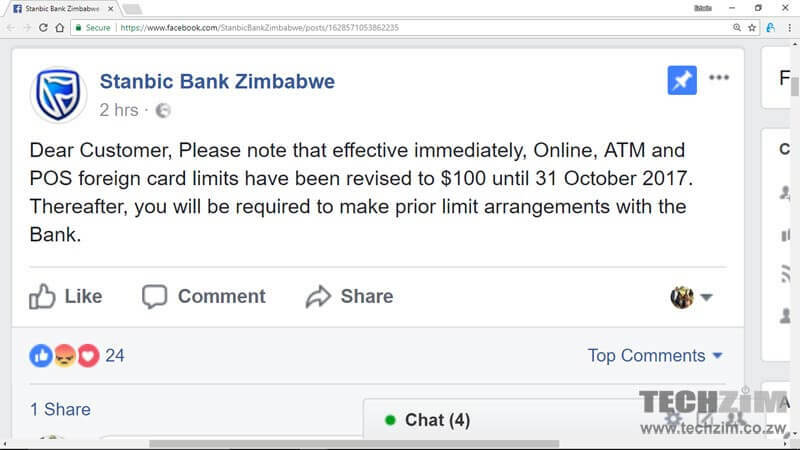 Just 13 days ago, the bank had sent out an announcement to their customers advising them that their limits had gone down to $500/month from $500/week, largely due to the cash crisis that Zimbabwe is currently going through. Dear Customer, Please note that effective immediately, Online, ATM and POS foreign card limits have been revised to $100 until 31 October 2017. Thereafter, you will be required to make prior limit arrangements with the Bank. This comes fresh after Techzim just made a post advising readers what the limits are for various banks. As can be seen, the conditions at banks change so frequently, making it difficult to know what the limits are for all banks at a given time. Stanbic Bank is not the first to adjust to the harsh realities that the current Zimbabwean economy has been throwing at citizens, with Steward Bank and EcoCash have recently adjusted too. The few banks that still allow one to use their RTGS/transfer money to make online payments and/or payments outside the country are just a matter of when (and not ‘if’) they will further reduce or stop the service altogether. This announcement essentially means that until the end of October 2017 (the next 6 days) one will only be able to transact with their VISA card to the tune of $100 (this is not a daily limit, but for the last few days). After that, one assumes that Stanbic may follow the Reserve Bank of Zimbabwe’s ‘priority list‘ to evaluate who will be getting access to forex or they may dig their heels in and not give any funds to non-exporting clients. If people start using foreign banks , they cry externalization. yet they are chasing away clients! OK non exporting. but let’s be honest these bank balances where from real us dollar inflows so maybe explain what happened to that money.